The MedGIFT project started at the medical faculty of the University of Geneva, Switzerland in 2002 and is since 2007 located in the Institute for Business Information Systems at the HES-SO in Sierre (Valais), Switzerland. The name stems originally from the use of the GNU Image Finding Tool (GIFT) for medical applications. Over the years the GIFT has been used less frequently and a large set of tools and applications have been developed to advance the field of medical visual information retrieval. All developed tools are open source and can be requested by email. Some very old tools might not be available anymore. A very strong collaboration with medical informatics and the University Hospitals and University of Geneva, Switzerland continues to keep the group activities in medical information analysis and at the interface between computer science and medicine. Still, no general breakthrough has been achieved with respect to large, varied databases with images of differing sorts and with varying characteristics. It has to be underlined that content-based access to data by visual features is complementary to text-based queries and is unlikely to ever replace them completely. One of the problems is the loss in semantic information when visual features are extracted automatically. The semantic web tries to solve part of the access problems through annotation, for example. In the medical field, images, and especially digital images, are produced and used for diagnostics and therapy in large amounts. 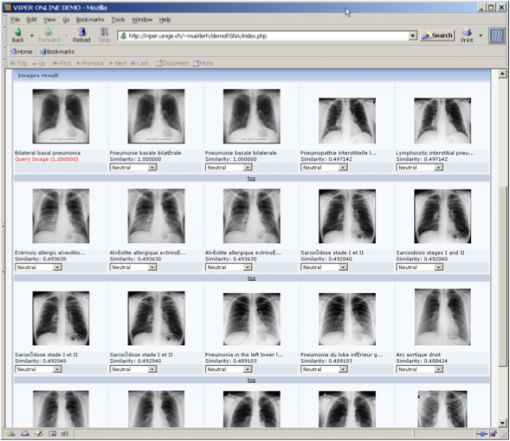 The Radiology Department of the University Hospitals of Geneva alone produced more than 200,000 images per day in 2011. With DICOM, a standard for image communication has been set and patient information can be stored with the actual image(s). In several articles, content-based access to medical images has been proposed and scenarios for the integration of content-based access methods into picture archival and communication systems (PACS) or into the diagnostic process are created. There are also several technical articles on technologies to search medical images by the content. Unfortunately, only very few systems have yet been integrated into the diagnostic process and there is, to our knowledge, only one study on clinical benefits of content-based retrieval techniques in the medical domain. In the ImageCLEF benchmark many systems have been compared for visual and textual retrieval over the years, which has advanced the field. It has become clear that textual retrieval generally has a much better performance than content-based retrieval. Still, content-based retrieval can have very good early precision and a combination of the two can lead to very good results. Current challenges of image retrieval systems include the combination of visual information retrieval with semantics and free text, the inclusion of the large amounts of tomographic (3D, 4D) data into the retrieval process and case-based retrieval, so not finding similar images but rather similar cases.